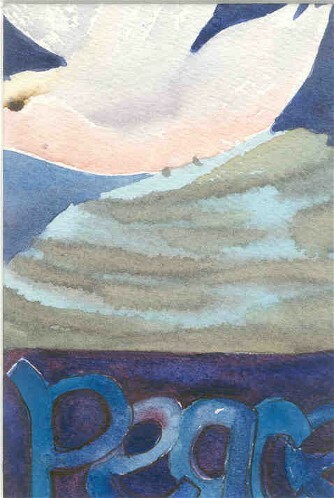 This painting has a sense of serenity and movement. My updated Koi slide show..
Its raining here and when I woke up I could hear it hitting my skylight in my little studio. I couldn’t wait to brew up some gourmet coffee and get right to painting something. 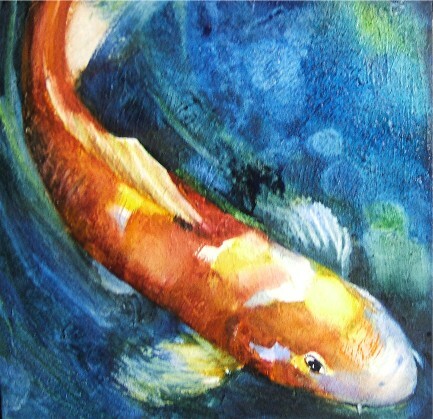 I’lll work on my large Koi painting today and try to get it finished. If you haven’t seen it, its on my work in progress weekly painting blog. 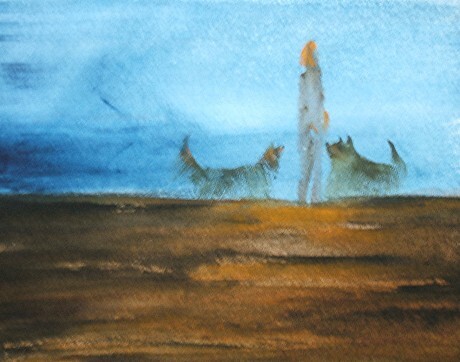 http://h20color.wordpress.com Its last weeks painting. This painting is a gift and will not be for sale. BY THE WAY MY BOG WILL BE SNOWING TILL THE SECOND OF JANUARY Enjoy! I have to check my records but I think this might be #115 in the Koi series. Since this Koi was a little on the thin side, I thought he looked like a young Koi just jutting out from his protective older cousin who he usually glides under and around. If you watch Koi you’ll always see the little ones saddling up besides the bigger koi for protection. 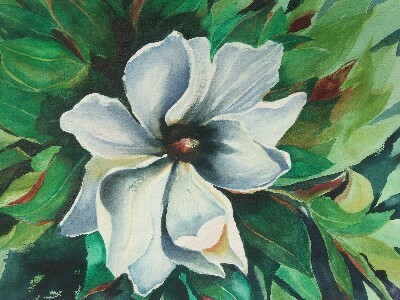 The size of this painting is 11 by 15 inches, a watercolor on 100% cotton rag paper. Of course if you would like a more professional look you could always frame it in a 16 by 20 inch standard size frame with a mat. 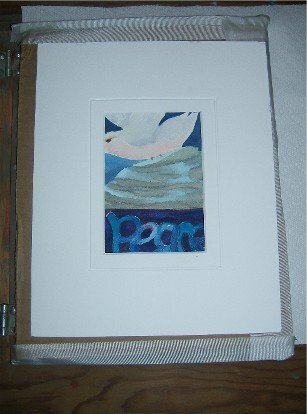 I sell this size painting framed for $300.00 So you see a little do- it- your- self can save you lots of money. 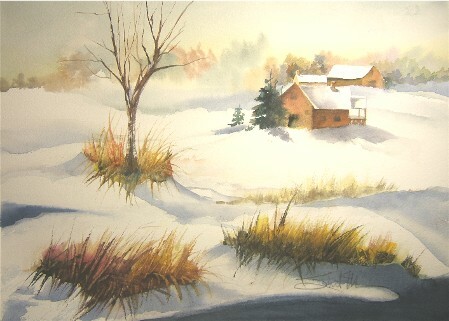 I’ve never lived in snow country and lots of folks tell me they like the way the cool snow paintings done in blues and greens look, I however have always tried to make my snow paintings a little warmer. Usually I put yellow or orange in the sky and it just seems to make the white of the paper (snow) glow a bit more by contrast. This winter has been a bit confusing for all of our plants and trees, some keep trying to bloom because it has been so warm. This week is a perfect example it will be very cold, say 42 to 54 degrees for a day or two, then it will be 60-70 degrees. The poor plants keep putting out flowers thinking springs here. Our magnolia tree puts out a few flowers and it almost seemed sad because I knew those flowers would die in a day or so. I thought it would be good to paint one of the Magnolia flowers, even though it was starting to turn brown. We had a very nice Christmas dinner, (I cooked, call Ripley’s believe it or not). We didn’t even have to call the fire department! 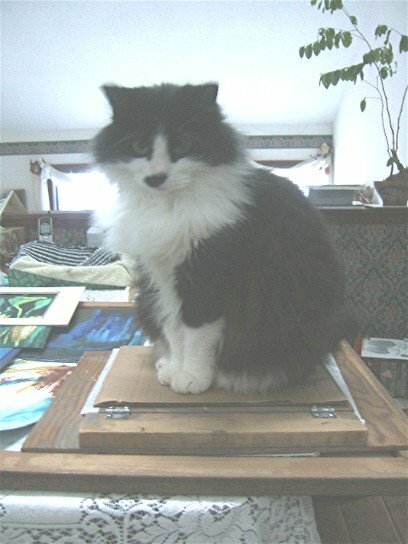 I have been asked about my methods for flattening out watercolor paintings after they have dried. Its an easy process and I think the paintings are so much more appealing. There are times when your have painted with a lot of water and your paper has buckled. This is easy to fix. I don’t usually tape down my paper especially for these small paintings. Often they don’t need flattening, but if they do, time is of the essence when you’re painting at least one painting a day. I’m like most folks and anything to save me a few minutes helps. Taping or stapling paper is just another chore, so I just don’t do it most of the time. 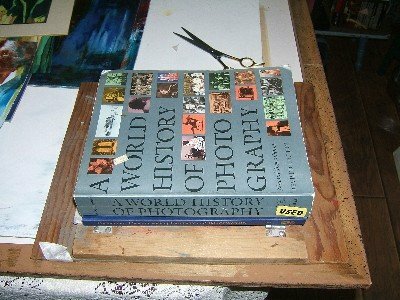 If my paper becomes warped I flatten it back out with a press. (or anything flat, like wood, or gator board), but since I’ve been asked about my press, I’ll show you how it works. It can be made rather easily by putting a hinge on two pieces of wood. This one is specifically for small paintings since it only measures 11 by 14. Using piano hinges is also a good idea, this one has regular hinges. You can see the bottom board is larger than the top board, both are plywood. 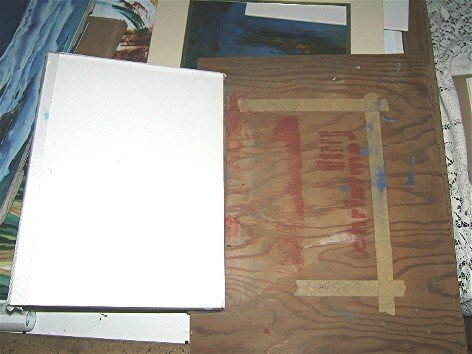 The bottom board is marked off with tape where the painting should sit. The top is just plywood too, but to make sure the plywood doesn’t stain the painting, I’ve taped mat board to the top board. 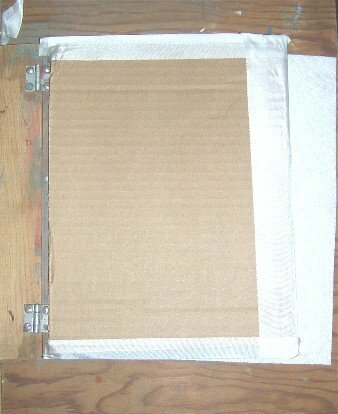 You place some paper towels on the bottom piece of plywood, place your painting face down, moisten the back of the painting lightly, place more towels on top of the painting and close the top. Here’s what mine looks like with the painting inside. I hope you enjoyed this little explanation .